Every innovative idea is discussed with customer and research begins. Naturally the end product receives instant recognition. PT. Bitratex Industries, is one of the leading manufacturers and exporters of finest quality spun yarns from Indonesia. PT Bitratex Industries is a joint venture company of Thakral group and Tolaram group from Singapore. The company was established in 1979. 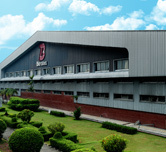 Its manufacturing plant is located in Semarang, the capital city of Central Java Province of Indonesia. Bitratex has a highly technical team of experienced personnel to ensure the right product quality.